Corals play a pivotal role in marine ecosystems, as well as, impact humans in significant ways. These marine species face threats as temperatures rise, and humans utilize fishing techniques that stun fish and release harmful chemicals into the oceans. Will cyanide continue to be problematic for corals or will new research lead to alternative fishing practices? Figure 1. 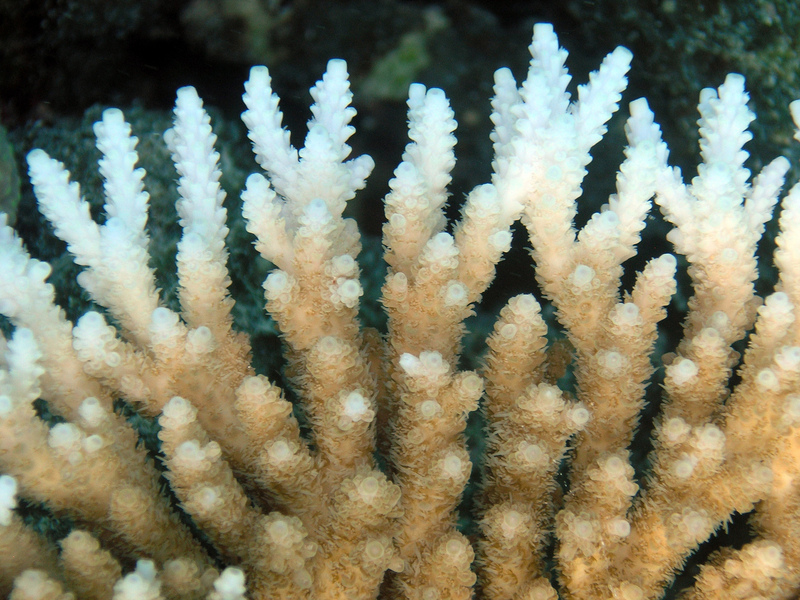 Corals show signs of bleaching as they begin to turn white. This effect can severely harm the coral and eventually lead to its death. Photograph courtesy of Oregon State University, 2012, FlickrCommons. CC BY-SA 2.0. Corals play a pivotal role in marine ecosystems. They provide shelter and substrate for many different species of fish and invertebrates. Furthermore, their impact on humans is significant. Coral reefs mitigate damage to beachside properties by damping waves, which would otherwise erode the beach. In addition, coral reefs are estimated to provide billions of dollars in revenue through fishing, biomedicine, and tourism.4 As such, maintenance of coral reefs is critical in oceanic conservation. Figure 2. What Causes Coral Bleaching? Courtesy of NOAA, 2017. Public Domain. Similar experiments support these results and have shown that cyanide specifically inhibits the Calvin cycle of photosynthesis in dinoflagellates.5,6,7,8 Concentrations for these experiments were carefully selected to find the level of cyanide which inhibits the Calvin cycle but does not affect other processes in either organism.5,6,7,8 In addition, some findings do not support the hypothesis that thermal stress alone can inhibit the Calvin cycle.8 Other research has shown that cyanide has a significant impact on the coral itself as well as other organisms which are exposed to high concentrations. Evidence suggests that cyanide inhibits mitochondrial activity, and therefore reduces availability of ATP (adenosine triphosphate) in cells.3 Together, this data presents a legitimate concern for coral health where cyanide is used. Both corals and their dinoflagellate symbionts are adversely affected by cyanide, which may exacerbate bleaching events. Figure 3. Alternative fishing techniques can be detrimental to aquatic species, such as the coral in coral reefs. Blast fishing utilizes explosives underwater to stun fish, making them easier to catch. Sodium cyanide is often used in a practice known as cyanide fishing in which fish are stunned with the substance and are then easier to capture for use in aquariums. Major factors contribute to major coral bleaching events such as in specific areas of the Great Barrier Reef in Australia. Courtesy of Drajay1976, 2013, Wikimedia Commons. CC BY-SA 3.0., Ella Weaver, 2017., and Oregon State University, 2016, Wikimedia Commons. CC BY-SA 2.0. Figure 4. Healthy coral reef are decreasing in number as coral bleaching events become more prevalent. Courtesy of NOAA, 2011, FlickrCommons. Public Domain. While there is still a need for more research concerning the causes of coral bleaching events, the effects of cyanide on corals are becoming well understood. Highlighting this cause allows for policies to address cyanide fishing through new methods of detection and screening of aquarium fish in countries with the infrastructure to do so. An understanding of the physiological impact cyanide has on corals and marine life will also allow for a broader view of toxicology of trophic levels within ecosystems. As more research highlights the impact of warming temperatures on coral bleaching, it is critical that more easily addressed issues are resolved to relieve local coral populations from some of these pressures. Drajay1976. (2013). [Photograph of explosive going off underwater]. Retrieved from Wikimedia Commons. CC BY-SA 3.0. NOAA National Ocean Service. (2011). 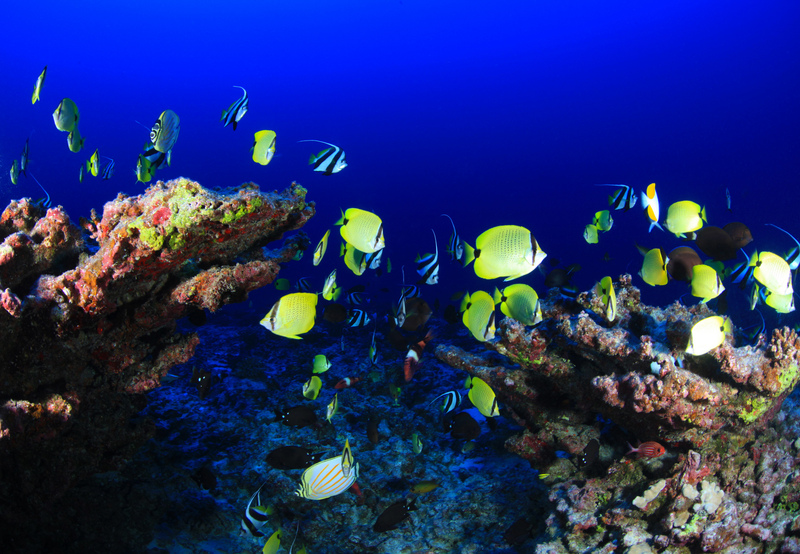 [Photograph of healthy coral reef]. Retrieved from FlickrCommons. Public Domain. Oregon State University. (2012). [Photograph of close up coral bleaching]. Retrieved from FlickrCommons. CC BY-SA 2.0. Oregon State University. (2016). [Photograph of mass bleaching event]. Retrieved from Wikimedia Commons. CC BY-SA 2.0. Weaver, Ella M. (2017). [Graphic of Sodium Cyanide]. 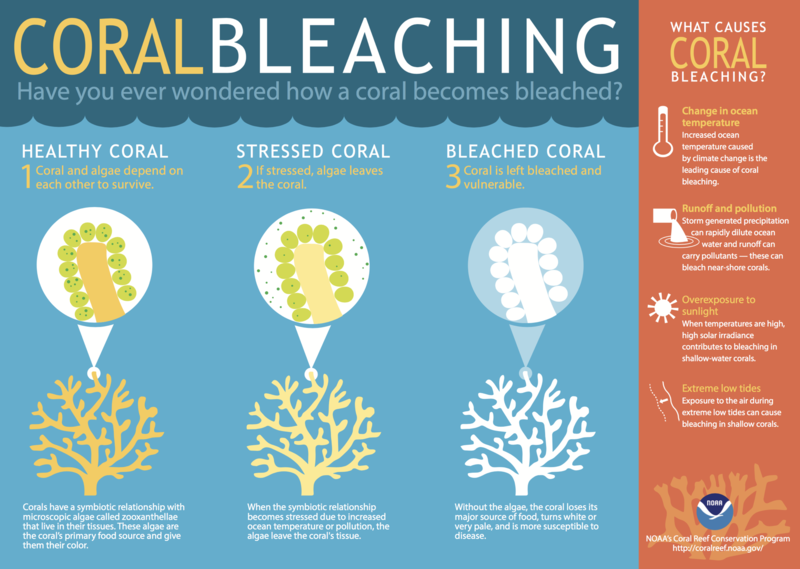 What is coral bleaching? (2017). National Oceanic and Atmospheric Administration. [Coral reef infographic]. Retrieved from http://oceanservice.noaa.gov/facts/coral_bleach.html.